Wars and tense political situations have had a profoundly negative impact on cultural life in a number of Arab countries and have endangered the transmission of musical tradition. Alongside Baghadad, Aleppo and Damascus belong to the most important music capitals of the Arab world and the cultural collapse underway in these places is accompanied by the loss of numerous historical documents, books, writings and artists' livelihoods and wisdom. By producing this CD we hope to save musical cultural assets from disappearing and, at the same time, to contribute something of our own. It lies in our hands to pass on traditions, to safeguard the fire and stoke it so that brilliant new colours may radiate from it. That is Nora Thiele writing in the sleeve note for the new CD Ahlam Babiliyya (Babylonian Dreams). 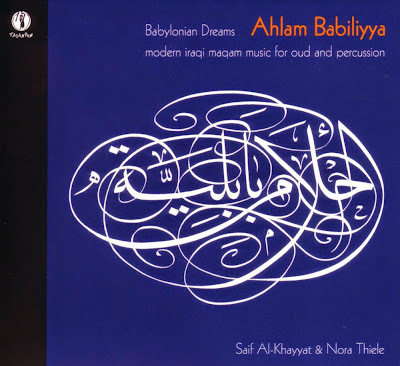 On it Nora Thiele plays frame drums with the Iraqi born oud player Saif Al-Khayyat in a programme of modern Iraqui maqam music - sample here. Middle Eastern music is based on a series of unique maqams or tone scales. In his fascinating new book Divine Attunement oud player and educator Yuval Ron describes how the rich diversity of the maqams has been distilled in the West down to the major scale (Ionian mode) and minor scale (Aeolian mode). He shares Nora Thiele's concerns, and argues in a chapter titled The Vanishing Modes that the globalisation - aka Westernisation - of Eastern music is putting at risk vital and diverse tonal traditions. No review samples used in this post. Any copyrighted material is included as "fair use" for the purpose of study critical analysis only, and will be removed at the request of copyright owner(s). Also on Facebook and Twitter.